Almost certainly one of the best known and most often quoted stories in the New Testament is Jesus’ parable of the lost or prodigal son found in Luke chapter 15. 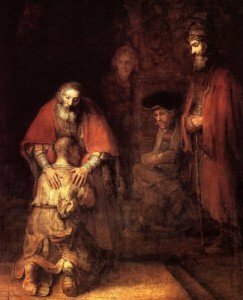 The phrase, “prodigal son”, has even worked it’s way into our vocabulary to characterize any number of behaviors that relate to being lost and then found. The story has been told so often over the years that it has it’s own name and meaning. Often though, the more familiar a story becomes and the more it is interpreted and quoted, the more chance there is for the story to take on meanings that may not actually be there. A great example of this is the story of the birth of Jesus. It is an accepted fact that there were three wise men (kings), one of whom was dark skinned, that visited Mary and Joseph at the birth of Jesus. These facts and events have been handed down through the ages and have been painted and the same stories told countless times. However, if you look at Scripture, nowhere does it say there were three of the wise men or what the color of their skin was. They were certainly not kings (magi were astrologers or magicians) and they were not present at the manger scene in Bethlehem, but arrived many months later. Over time, special ways of seeing some of these Bible stories have been imprinted in to the minds of many readers, even though they do not correspond accurately with the text. This process has probably been more pronounced with the parable of the prodigal son than with any other New Testament story. Many of the details of the story when looked at in a cultural light are perhaps not what we always thought the story said and meant. A careful examination of Luke 15 will reveal some interesting ideas that will revolutionize our thinking on this well loved story. For our first lesson, let’s take a closer look at the story as it appears in Luke, the only place in the gospels that it is found. The first thing a careful observation reveals is the fact that the parable of the lost son is only a part of a larger parable that Jesus told to his audience. Look carefully at Chapter 15, verse 3. It says, “Then Jesus told them this parable”, not, ”these parables”. The words translated there are both singular. What He was about to say was one parable. Then a collection of three stories follows, the lost sheep, the lost coin and finally the lost son. Jesus told three stories together to make one point, which we will later see. The Bible translators have conveniently given us three headings for these stories, but they were originally all just one big story given by Jesus to make His point. Jesus was being criticized by the Pharisees and the teachers of the law for his willingness to mingle with and eat with tax collectors and sinners (see verses 1 and 2). By eating with them in this culture, He was accepting them and recognizing them as worthy (see Acts 11:3,1 Cor 5:11, and Gal 2:12). His audience of Pharisees and teachers of the law was a very scholarly and educated group and Jesus replied to these two groups alone and not the crowd in general. Jesus was also known to be an intellectual and was called rabbi or teacher. The reader then assumes that the story that follows will be a carefully organized, scholarly presentation to convince his well-versed, intellectual audience of His point. What do these three stories in Luke 15 have in common? These four points of connection certainly lead us to understand that Jesus meant this as a single, three part parable, which He used to make a single point. His point is made in response to the Pharisees and teachers of the law’s complaint that he eats with sinners. He seems to be saying in these three parables, “You accuse me of eating with sinners. You are absolutely right about that, I do! However, I not only eat with them, I am willing to go out and look for them, do whatever it takes to find them and bring them back and the shower them with kisses and put fine clothes on them, just so I can rejoice with them. It is even worse than you thought! Let me show you what I mean”. In the next lesson we’ll examine the first parable of the lost sheep in more detail and begin to see how all the three stories in Luke 15 are actually one big story that Jesus told to show us the breadth, height and depth of his Father’s great love for us.